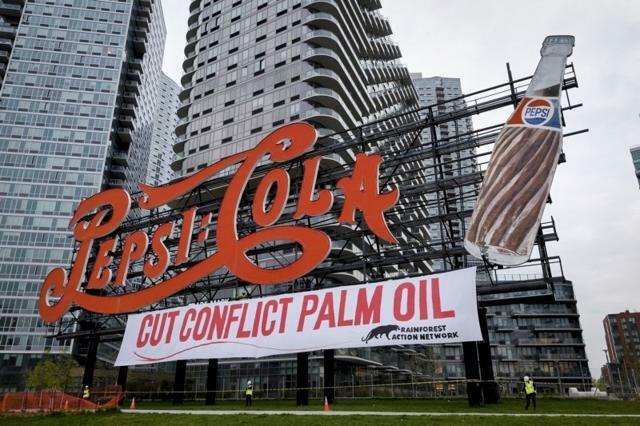 Figure: Activists on Monday delivered their demand by draping a massive “Cut Conflict Palm Oil” banner from New York City’s iconic, six–story–tall “Pepsi–Cola” sign. Possible sourcing relationships to Reforestadora de Palma dePetén SA (REPSA), a palm oil company purportedly involved in the killing of Guatemalan Indigenous rights activist Rigoberto Lima Choc on September 18, 2015, kidnapping of three others, Hermelindo Asij Mo, Lorenzo Pérez Mendoza and Manuel Perez Ordoñez and ongoing intimidation of human rights defenders. Relationships with Indofood Agri Resources. A report in early 2017 by Chain Reaction Research suggested that 42 percent of Indofood Agri Resources’ 549,287 hectares land bank is contested. In fact: Six plantations allegedly have community conflicts and labor controversies. Four plantations are located on peat and/or forest areas, potentially prohibited from development given Indonesian government regulations. 16 plantations do not publish concession maps. Major palm oil traders Cargill, Wilmar and AAK involved in sourcing from palm oil plantations are threatening the future survival of the Leuser Ecosystem – the last place on Earth where orangutans, tigers, rhinos, elephants and sunbears still coexist in the wild. PepsiCo’s global suppliers are selling PepsiCo material risks that PepsiCo’s investors may now own. TIAA’s investment services clients – 14,000 of them – and a broad coalition of international organizations requested last week that TIAA address material financial risks in how the firm’s manages its global agriculture investments. TIAA is one of the largest global investors in farmland, with over 607,000 hectares under management in the U.S. and around the world. These farmland assets are worth about USD 8 billion. In aggregate, they represent about 1 percent of TIAA’s overall assets under management. To mitigate this material financial risks, back in 2011, TIAA signed the Farmland Principles for responsible investing focusing on robust investment and sustainable management of farmland assets. Now this TIAA–CREF client–led coalition is requesting that TIAA demonstrate compliance with these principles in how they manage their assets under management. This is because recent reports, described in The New York Times in 2015, claim that TIAA has promoted land speculation by investing hundreds of millions of dollars in Brazil’s cerrado wooded prairielands. These TIAA clients allege that the firm’s investments lead to land speculation in Brazil that contravenes Brazilian law restricting land ownership by foreign corporations. Similarly, according to TIAA’s 2015 report Responsible Investing in Farmland, the firm owns 256,300 hectares of farmland in Brazil. Their clients are extremely concerned that reports of land grabbing and human rights violations in Brazil are systemic. Beyond its direct land investments, as of March 20, 2017, TIAA has at least USD 170 million invested in SE Asian palm oil companies, some of who also represent similar material financial risks to TIAA and its clients. A USD 841,837 position in Felda Global Ventures. Last week, it was disclosed via drone video that Felda’s subsidiary is actively engaged in deforestation against Felda’s Board of Directors instructions. In August 2016, Felda’s Board of Directors published a risk management policy which its subsidiary is nowv iolating. Felda is clearly not implementing the prevailing HighCarbon Stock Approach. Its own audit has shown continued risks of forced labor and other workers’ rights violations. A very small position of USD 228,191 in PT. Sawit Sumbermas Sarana, which was profiled in The New York Times this week as having possible material risks related to deforestation. A USD 8,994,258 position in POSCO Daewoo whose subsidiary PT Bio Inti Agrindo cleared about 7,500 hectares in Papua, Indonesia in 2016. More than USD 5,000,000 invested in Indofood Sukses Makmur and its majority–owned company, Indofood Agri Resources. Finally, TIAA is also one of the largest pension funds purchasing farmland in the United States, currently managing over 93,000 hectares worth over USD 4 billion. Over 50 percent of U.S. farmers are expected to retire in the next 15 years which means that land speculation could have negative financial impacts on U.S. rural communities. TIAA invests throughout the U.S. in the production of grapes, rice, corn, soybeans, cotton, vegetables and cranberries. Describing its investments, directly or through its subsidiaries, in all farmland in the U.S., Australia, Brazil and other countries. Cease enabling, through its investments, illegal land acquisition. Refrain from investing in companies that violate policies meantto prevent illegal land acquisitions. Invest in institutions that have clear and credible processes toprevent illegal land acquisition. Likewise, other major banks and investors are facing similar possible material financial risks as TIAA. As shown in Every Investor Has a Responsibility, A Forests and Finance Dossier, many financial institutions have not incorporated similar tools – as clients requested of TIAA – into their environment and social risk management processes to mitigate material human rights and deforestation risks. This report profiles possible human rights and land acquisition abuses associated with Felda Global Ventures, Indofood Sukses Makmur, IOI, Wilmar, Asia Pulp and Paper, Oji Holdings, Marubeni and Itochu in addition to climate and biodiversity risks prevalent in the tropical forest sector. The findings raise serious concerns about continuing gaps in the financial sector’s social and environmental safeguard policies and related due diligence procedures for the forest–risk sector, including palm oil, tropical timber, pulp and paper, and rubber.